As the Fiduciary Services Manager, Penny’s primary function at Maine Fiduciary Services is overseeing all fiduciary services relationships including trusts, estates, special needs trusts and powers of attorney. Penny works directly with the estate planning and trust administration attorneys to assist with client services related to the fiduciary needs of these relationships. Penny grew up in Maine, where she brings to the firm over 30 years experience working with investment and fiduciary relationships in the banking financial area. In 1999, Penny completed a two year course majoring in Trust Administration and Investments at the New England School of Banking at Williams College. 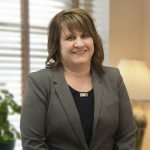 Prior to joining Rudman Winchell in 2017, Penny was the Vice President and Wealth Management Operations Manager for a local banking institution. Penny and her husband Michael have two children. In their spare time they love to go camping by one of Maine’s many lakesides and are members of a local bowling league. When Penny’s children were young, she was an active member and leader of a local Girl Scout troop. Currently, Penny is a member of the Bangor Region Chamber of Commerce’s Biz Action Group.